Spam Messaging has gotten out of control.... WHY? Please EA admins do something once with this person or bot or whatever it is once, we can not be longer. Definitely use a bot or something similar it is impossible for a person to send 1 message per second, as shown in the attached image. The same advice as before, report using the in-game system. The developers can follow up reports and make sure that customer services actually do read the report and act upon it. Also, as many of your alliance as possible should also make reports as this makes action much more likely than one individual reporting another. We are contacting EA customer support about this repeated offender. Hope that the repeated offender will get a perma-ban on that server, and anywhere else. He might continue his schemes in other TIberium Alliances servers. Also is the spam offender the same one who spammed the forums before with an random string of letters or numbers, or is he a different person? Also to prevent and miimize cases, can you add a blacklist feature? A PM messaging limitation is also nice. E.g. if a player is not in a high rank position of a big alliance (30 members or more), he can only send his mails to 5 clients with a recharge time of 10 minutes between creating new PM's. Easy solution is to add 'block sender' to the mail in game... jessshhhh. Most spammers would try to circumvent that by creating a new account. What we need is limitations for PM's and posting to avoid over-exploitation. There was this guy who went too far in the forums and posted at least 6 images with some indecency in it. His account is usually a random sized string of words and letters. Each time he is blocked, he comes back with a new account as if the blocking never happened. Only EA can tell if it is the same IP address as previous spammers and IP addresses can easily be fudged. Each time a ban is implemented it is on all servers - so the next stage, I suspect will be a longer ban than the one already received of probably 3 days. 7 or 31 days is probably next on the list before a permanent ban. > We are contacting EA customer support about this repeated offender. > Hope that the repeated offender will get a perma-ban on that server, and anywhere else. He might continue his schemes in other TIberium Alliances servers. Also is the spam offender the same one who spammed the forums before with an random string of letters or numbers, or is he a different person? Also to prevent and miimize cases, can you add a blacklist feature? A PM messaging limitation is also nice. E.g. if a player is not in a high rank position of a big alliance (30 members or more), he can only send his mails to 5 clients with a recharge time of 10 minutes between creating new PM's. > Only EA can tell if it is the same IP address as previous spammers and IP addresses can easily be fudged. > Each time a ban is implemented it is on all servers - so the next stage, I suspect will be a longer ban than the one already received of probably 3 days. 7 or 31 days is probably next on the list before a permanent ban. thats all? 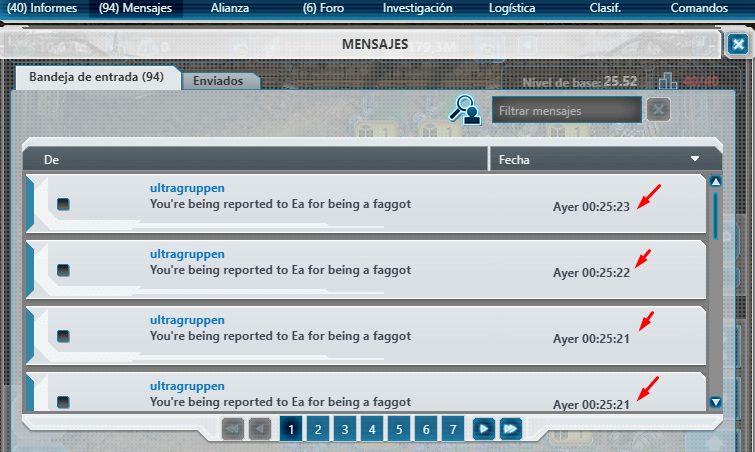 if every player on one world get spam and personal attacks and you say only ea can tell if its the same id? ban this little kid, because if someone write me in a message he will **** my mother its not a joke for me, read your own rules and do something, hes reported ingame about 100 hundret times and nothing will happen? what you guys are doing here? whats your job? I can say with certainty not every player is getting the messages. Something will happen - he'll be banned. EA escalate things in set stages. Here, we can't do anything about in-game offences other than advise you to report them. The developers also have to follow a set of rules, the same as a customer services representative. My role (it's not a job as I don't gain anything from it financially) is to moderate the forums. The developers role (and job) is to develop the game and provide gamer operational issues support. My response about IP addresses was in relation to a particular question posed about a previous spammer of this forum, not in-game spamming. Only EA have access to IP information. Only EA can tell if the IP address is the same when spam comes from multiple accounts. The content of the spam may indicate the same spammer, but in the case of the forum spammer and the in-game one they are different content so there is nothing to indicate it is the same person. Well, he has already received a temporary ban as first offender and if he insists on continuing this behavior he will get a ban for good eventually. Let it be... 200 more malls today, on this server is war, so I can't delete all the messages without looking if there are some importent messages... Most of the player here spent money for the game so do your job pls and ban him... And don't sent him a warning... On other games it will need 5 reports not 5000... Why you have the rules???? 200 more mails today, on this server is war, so I can't delete all the messages without looking if there are some important messages. Clearly, what is the goal of the spammer if he is sending 10 messages per minute to anyone he can annoy? Is he a Tiberium Alliance hater, to the point that he wants to spam everyone to death so that they would hate Tiberium Alliances due to someone violating the TOS? What I'd favor is a blacklist feature so that the players can at least control it in their own hands. I mean the spammer doesn't know if all his victims blacklisted him. If the moderators are too slow to tackle the spammer, he might switch IP addresses to circumvent the ban and continue harassing his 100+ victims. In other words, I want the developers to "SHUT HIS BABBLING MOUTH"! It is so that he would no longer harass anyone and ruin TIberium Alliance's reputation any further. The moderators need to take action quickly otherwise, Tiberium Alliances might loose its player base. It would threaten the server by means of closure since there is barely any payment for the game. Moderators aren't 'too slow to tackle the spammer' as we have no role in the in-game mail. Moderators have no special tools at all for in-game violations. We can't see any IP addresses or even get onto worlds where we did not launch a base at some point. I do however agree that an in-game blocking function would be very useful. Remember the main enemy or problem person is the spammer! I know you weren't attacking me (or the other forum moderators) but language is important and so is terminology. Customer Services personnel are the ones responsible for receiving and then dealing with in-game complaints. They will only be 'doing their jobs' as far as their contract is concerned, following official guidelines. They do seem to act slowly, very slowly at times but they do act. I will draw attention to the developers to the fact that CS haven't reacted, maybe that will result in some action. I take it that the spammer is still active on FS10 - please confirm. There hasn't been any complaints on this topic recently. Maybe he has been taken care off. This I very much agree to, as spammers are left powerless if all his victims secretly blacklisted him. Also a mail recipient limitation would be quite nice. One can only send mail to at most 5 recipients and can only send mail once every 20 minutes, unless he's replying to someone's message. The limit must be higher than 5 recipients - there are upto 50 in an alliance and a number of wings with upto 50 each. Maybe the limit should be 10 or 20 not in your ally or Nap'd unless you are an officer or above. Spammers in an ally would quickly be dismissed, in a Nap'd alliance the NAP can be cancelled by an office with diplomacy as a remit unless the cic dismisses the offender. Guys it is easy to deal with spam mail to ensure it does not impact on your game. I would post pictures with my advice but i am "new" and therefore i don't have that privilege yet. 1) Type the name of the spammer (or part of his name) into the mail filter box. The above takes no more than 2 minutes and your inbox and game are returned to normal for you to continue to play as you wish with no more inconvenience. Repeat each time you receive spam mail.